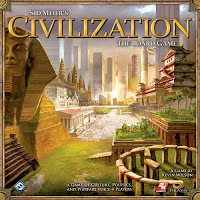 In Late Fall of 2010, Civilization--The Board Game was unleashed on the masses by our friends at Fantasy Flight. Here is my review. . .please hold all comments, questions and smirks to the end. . . I have to hand it to Fantasy Flight because they just don't shy away from many tasks when it comes to making big and bold game designs. They have been taking on a number of really known quantities from a branding perspective lately and really jumped in the bear cage with Civilization. Bear cage too strong a term? Well, how else would you classify taking on one of the most beloved video game franchises of all time? The real question though is: do they succeed? The answer from this reviewers point of view is they got really darn close. So, if you have ever played CIV on the PC, you know how Civ the board game works. You start with a Civilization (Dan has talked about a few of these in the blog: we have the Americans, the Chinese, the Egyptians, the Germans, the Romans and the Russians) you build a city, you explore the land. One really big difference. . .on the PC you point and click. . .in the board game you run the whole f'n show. So at this point you start to realize, will this be fun or a chore. I lean toward fun, but those who hate fiddly games are going to think borefest chore--but more on that later. Each CIV has a starting tech and a special ability--with some much more stronger than others--I'm looking at you Cleopatra and Mao--most CIVs start with Despotism as their starting Government except for Rome (Republic) and Russia (Communism). Basically, these are pretty self-explanatory, in Start of Turn you do some beginning of turn maintenance--the most important of which is to build your second and third cities (Indeed you won't be able to replciate your 77 City Masterpieces from your CIV IV or V PC Games). In Trade, you collect your trade and have an opportunity to trade virtually anything with your neighbors. In City Management, you produce--one-item per city. . .building much important tile upgrades, or troops, harvesting a resource or simply taking culture. This phase is where all games are won or lost. You have to manage your cities efficiently and continually plan ahead on what you need from each to move your Civilization forward. One or two mistakes in this phase can bury your Civ's progress. In Movement, you move your scouts and your armies. . .possibly finding other lands, friendly villages (goodie huts) or vile barbarians. In the final phase, Research, you possibly spend trade to learn a tech and add that to your Tech Pyramid. All future techs grant you advanced abilities, items, armies, movement, etc. Culture Victory--Sing and Dance your way to a win--Ok, singing is optional, but you do have to dance your way up the Culture Track--this is first accomplished by obtaining culture from your cities and wonders but eventually you need a strong economy and be producing enough trade to "Support the Arts." This sounds easy, but in the endgame, you must produce a ton of trade and culture to maintain your ascension up the track. Tech Victory--Beat your opponents to the fifth layer of the tech tree. . .fly with some friends to lovely Alpha Centauri, suffer a cultural breakdown and fight your friends to control the planet. . .wait a minute, that's a whole different game--maybe a future expansion? In all seriousness though, this seems to be the most common way to win the game. Economic Victory--get 15 "Coins" essentially coins work as your in-game economic progress--keep a steady cash flow via city tile improvements, wonders and tech, then you will improve the number of "Coins" you have each turn--this can be done, but it isn't as easy as it sounds. . .
Military Victory--kindly remove your foe from their capital and win the game! Again sounds easy, but this is a very, very hard task to accomplish. So each turn you are moving your CIV toward these goals. . .you track your progress on your Civ Sheet and I have to say the designers really scored here. You track nearly everything right there on your sheet: One Dial for Trade and one to keep track of your coins. Trade is the most important thing in the game because it fuels your research. You get to bank trade as well and you can also (fittingly) trade it with your neighbors. Coins really are the sign of a great or not so great power. . .and as the old saying goes money is power. . .having multiple coins allows for you to bank trade each time you research a tech. . .a level III tech costs 16 Trade. . .but if you have five Coins. . .the tech only costs 11 Trade. The other big part of the game is Military Battles. . .through out the game you will be buying Infantry, Mounted, Artillery and (eventually) aircraft to bolster your forces. These units combine to form your army but travel the lands as an army flag. I won't get too in depth with the battles, but essentially it is a card-driven mechanic where higher value wins unless one force trumps another--i.e. Infantry Trumps Mounted. It works ok for what it is, but it's probably the least favorite part of the game form my perspective. I mean if I am aleady managing a ton of other things in my Civilization, why not give me a way to build and manage specific units (I smell a future rant here in this blog). As you venture deep into the game and into your tech tree, you quickly realize that you best have been focusing on one of the winning conditions. This is not a game where you can viably multi-task. If you were focused on building a grand Army, you can't turn around two turns later and hope to win the Oscar in the Culture Race. Focus and resource management is key. Another key item is getting your three cities built as fast as you can--this requires some planning as well as you need specific techs to enable your empire to expand and grow. The beginning of the game usually moves well, but the mid and end games can be very time consuming--again this is a game best played with both CIV veterans and those who know the rules. Plan well and you will be vying for the lead at the end of the game. Bungle your way through the first 10-15 turns and you will be cursing yourself as you flounder away toward the bottom of the virtual CIV power rankings. I really like this version of Civilization--The Board Game. It isn't perfect by any means, but it does a great job of capturing the essence of Sid Meier's creation. More so, it really forces you to consider winning the game through means other than Military Might. So even though the game takes a lot of planning, and a lot of micro-management, the journey is worth the effort. I highly recommend that you try this out sometime. You'll know in the first 45 minutes if the game is a keeper for you. Pros: Captures the essence of the PC Game. Looks great and has excellent components that work well together. Lots of interaction with your friends/foes. Cons: Lots of planning and management. Very random military system. Can drag out with the wrong mix of players. Can also be harsh at times for those with bad planning skills.